How Green is Governor Snyder? 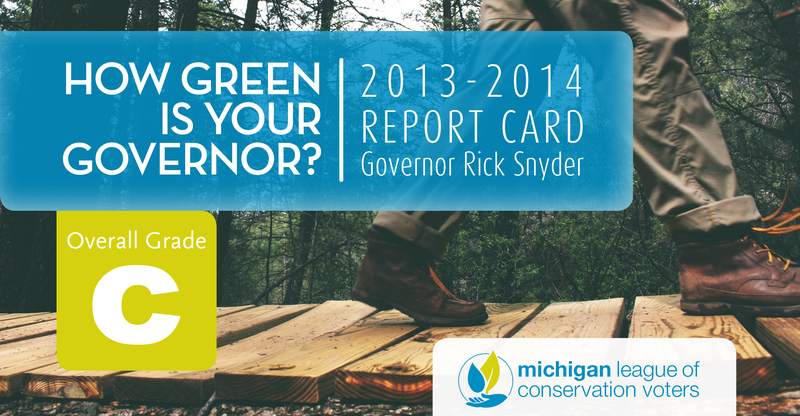 Throughout his campaign, Michigan LCV watched Rick Snyder campaign on a conservation platform. It is now Governor Snyder’s time to turn his promises into actions, because actions always speak louder than words. Michigan LCV’s “How Green is Your Governor?” tracks and grades all of the actions of Governor Snyder, his administration, and the statewide departments he directs as decisions are made on issues that are vital to re-energizing our economy, protecting our environment and moving Michigan forward. Monitoring the Governor is vital to assuring that the “buck stops with him” and the administration is held accountable for protecting clean air, water and all of our natural resources. Review the most recent actions we’ve tracked and scored below. Governor Snyder’s 21st Century Infrastructure Commision estimated that Michigan needs to invest $800 million annually to meet our state’s critical water infrastructure needs. In response, the Governor announced a plan that would generate $110 million per year from a state assessment on users of public water systems with more than 1000 customers. Of this $110 million, $75 million would go into the State Capital Investment Program to provide grants for local water infrastructure improvements, $10 million would be deposited into the Emergency Infrastructure Failure Fund to help communities manage water and sewer failures, and $25 million for Integrated Asset Management Planning (drinking water and stormwater systems, local data collection, materials inventory and training, etc.). 80% of the fee generated from the assessment on users of public water systems would return to the community that contributed it. This is another wise set of targeted investments from the Governor, but, unfortunately it is too little too late. The proposal represents only about 14% of the annual need identified by the Governor’s own Commission. At a moment when the State needs a Marshall Plan for Water, this proposal leaves us wanting more. Michigan LCV is pleased that the Governor announced a plan and hopes that Michiganders gain something from it, but our hope for an adequate investment in water infrastructure is now vested in future leaders. On Tuesday, January 30, Gov. Snyder announced his proposal to replace the depleted CMI funding source. He proposed to invest $79 million annually to help renew Michigan’s environment and protect public health. The proposal would be funded by an increase in the current landfill dumping fee of $0.36 per ton to $4.75, matching Ohio, but remaining below many other Midwest states. This fee increase would generate critical environmental protection funding needs while enhancing Michigan’s recycling and waste management planning. The cost of Gov. Snyder’s estimated $79 million annual funding proposal would be on average less than $5 per household. $45 million of the money would be dedicated annually to fund the core CMI Remediation and Redevelopment programs, $9 million for Solid Waste Management, $15 million would fund recycling grants to increase Michigan’s Recycling Rate from 15 to 45%, $5 million in Water Quality Monitoring Grants, and another $5 million for State Park Infrastructure. Gov. Snyder calls the proposal “Renew Michigan.” Michigan LCV issued the following statement in response to Governor Rick Snyder’s “Renew Michigan” proposal, which can be found here. The Governor acknowledged that funding for the CMI is gone and that when it originally passed it was incredibly popular (63% of the vote). He called for a “better” replacement that would not leave “our children in debt.” We hope to see the Governor offer sustainable, creative solutions to fund the CMI in the coming week and in his budget presentation on February 7th. “We got complacent. We’re behind. We’re half the national average on recycling — we have to do more — for our own good. For the wellbeing of our society and our world.” The Governor is right, and he admitted to his disappointment in Michigan’s recycling rate (~15% and half the national average) and acknowledged the lack of progress made during his time as Governor. We hope that he prioritizes this in the coming year and lays out plans to allocate funding and improve our waste management systems. The Governor said there has been “Too much talk and not enough action! Let’s get together as Michiganders and invest where we need to protect the Great Lakes,” referring, solely to Asian Carp. He is right, but his hyper-focus on one single iconic invasive species, rather than the myriad of others makes for good politics but puts our Great Lakes, inland lakes, and rivers at risk. We hope to hear a broader approach to invasive species and water quality ecosystems next week. The Governor has called for a Marshall Plan for talent, but what we also need is a Marshall Plan for water. The state needs to create a comprehensive plan to address the looming threats to our drinking water, Great Lakes, rivers, and streams. From Flint to Line 5 — action is desperately needed to protect the health of Michigan families and our natural resources. The Governor said, “Let’s be proactive, not reactive, and in a thoughtful fashion go out and solve the problem.” In 2018, we will need the Governor to stand strong against legislative attacks on the Department of Environmental Quality (DEQ): attacks that will bypass proactive measures by DEQ scientists that protect Michiganders from environmental harm. We also need regulatory processes to be reformed in a manner that makes them amenable (in reasonable time) to scientific progress. Relying on the federal government’s minimal standards to protect Michiganders is not good enough. The Governor was excited about electric vehicles and the future of advanced mobility in Michigan. He said that the next generation of mobility will, “transform the world — it’s going to save lives. It’s going create opportunities for people that are seniors, for people with disabilities and people with economic issues. They will be able to travel and do things that they were never able to do before.” He pointed to the great efficiencies and cost savings that can be garnered in a smarter, more advanced mobility infrastructure economy. Advanced mobility will require a modernized electric grid that is more reliable, more efficient, and that could save consumers money while decreasing carbon emissions and air pollution. Likewise, we should work toward the ‘holy trinity’ — fully electric, driverless cars, summoned by on-demand ride-hailing services drawing electricity from a low carbon grid. If the state takes advanced mobility seriously and rolls it out carefully and thoughtfully, we will unleash the next great industrial age — and with our great manufacturing capacity and research universities, we are poised to be at its epicenter. Governor Snyder appointed John Walters on the Natural Resources Commission. The Michigan Natural Resources Commission (NRC) is responsible for programs and policies that protect our public lands and allow Michigan citizens to access and enjoy our state’s natural resources. John Walters will succeed John Matonich to represent independents for a term expiring December 31, 2021. Walters currently serves as the Chairman of Michigan Trout Unlimited and the Pigeon River Country State Forest Advisory Council and, is on the executive board of the Anglers of the AuSable. Walters has served on many different workgroups and councils, appointed by the Director of the DNR but currently works full time for Roseburg Forest Products. Governor Snyder signed House Bill 4880, sponsored by Representative Griffin. This bill is a common-sense solution that enables schools to finance energy conservation projects. This bill will collectively allow school districts to better facilitate energy efficiency by authorizing an additional financing method for energy conservation projects, increasing the financing period for energy conservation projects, and expanding the types of energy conservation projects that qualify. This bill allows school districts to make energy conservation improvements to their facilities through a tax exempt lease-purchase agreement. Lease-purchase agreements allow the districts to take title to the improvements when the lease is signed. The use of this new financing method will allow school districts to undertake needed energy efficiency projects without incurring substantial long-term debt. Additionally, the bills would extend the installation contract and financing period for qualified energy conservation projects from 10 years to 20 years and allow school districts to use Lease Purchase Agreements as a method to finance energy efficiency upgrades in their facilities. Judge David Lawson of the U.S. District Court for the Eastern District of Michigan approved a settlement reached between several parties in a lawsuit filed in January 2016 against the state of Michigan and city of Flint. The settlement agreed to and signed by the Governor includes the following responsibilities for the State of Michigan: Allocation of $87 million to fund continued service-line replacements for residences in the city of Flint; continuation of the Community Outreach and Resident Education program (CORE), with workers going door-to-door every day to inspect faucet filters and inform residents about available services, including faucet fixture replacement; provision of free faucet filters for residents while the city’s pipe replacement program is ongoing; continued delivery of bottled water within 24 hours to Flint residents by request; operation of at least two community water resource sites until Sept. 1, 2017 and, payment of plaintiffs’ attorney fees in the amount of $895,000. → Require the establishment of Water System Advisory Councils for most community public water systems to assure citizen membership, input, and access. The councils will develop plans for community outreach and education, and collaborate with community groups to assure correct implementation of the LCR. The councils will assure access to information regarding corrosion control, testing results, remediation processes, educational efforts and general water safety. → Require public water systems to perform a full system inventory identifying materials used, such as lead service lines. → Phase in a reduction in the Lead Action Level from 15 ppb to 10 ppb by 2020. → Strengthen sampling methods and require annual testing at state licensed facilities involving children and vulnerable adults, including schools, day care facilities, nursing homes, health facilities, and adult foster care facilities. → Require public disclosure of testing results or filters on every drinking water faucet in state licensed facilities involving children and vulnerable adults. Facilities exceeding standards will be required to take remedial action. → Prohibit partial lead service line replacements. → Require landowners and property sellers to disclose to renters or new homeowners of any service lines or plumbing that are known to contain lead. Governor Snyder delivered his Department of Natural Resources (DNR) budget recommendation for the 2018-2019 fiscal year, which saw an increase from the previous year’s budget. The Governor’s proposed budget for fiscal year 2018 recommended total funding of $416.4 million, of which $64 million was general fund. This included one-time funding of $23.8 million, of which $22.8 million was general fund. The recommendation for fiscal year 2019 was $392.6 million, of which $41.3 million was general fund. The fiscal year 2018 Executive Budget Recommendation highlighted the Governor’s focus on conservation, protection, management, accessible use, and enjoyment of our state’s natural and cultural resources. This funding primarily focused on parks & recreation, wildlife & fisheries enforcement, and forest resources. For How Green is Your Governor? posts prior to 2015 please reference our Gubernatorial Report Cards, which compile all actions we’ve tracked and scored and provide overall grades for the Governor every two years.